Leavitt Digital (LDCRE) is a free Commercial Real Estate Listing Distribution Platform, disseminating CRE Listings to 500 news websites around the globe. LDCRE enables brokers and owners to increase local and global reach on listings through LDCRE’s national and international listing syndication platform into city based news websites. Leverage LDCRE’s market reach to increase your listings and sales. LDCRE is entirely free to list and search commercial real estate for sale and commercial real estate for lease. LDCRE’s Market Reach LDCRE forged a partnership with Geocentric Media, where LDCRE’s listings power the Commercial Real Estate sections throughout all of Geocentric Media’s news websites. LDCRE’s listing syndication powers the Commercial Real Estate sections in 500 news websites and projects it will power 2,000 news websites by close of 2019. 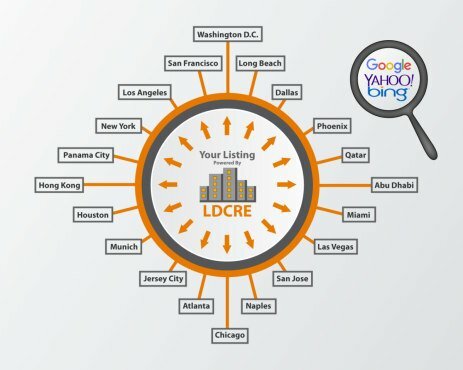 LDCRE is an Open-Network, thus not locking any listings from view or searches via Google, Yahoo, Bing. LDCRE is a listing distribution platform, disseminating CRE listings to 500 News Websites in metro markets and regions throughout the globe. LDCRE's listing distribution platform will reach 2,000 news websites by close of 2019. Use the LDCRE via API to connect through your website or third-party CRM. Listings to LDCRE for FREE today!